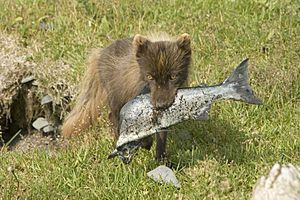 The Arctic fox has a functional hearing range between 125 Hz–16 kHz with a sensitivity that is ≤ 60 dB in air, and an average peak sensitivity of 24 dB at 4 kHz. 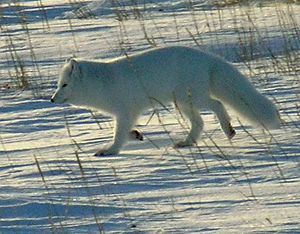 Overall, the Arctic foxes hearing is less sensitive than the dog and the kit fox. 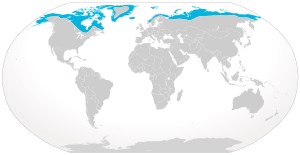 The Arctic fox and the kit fox have a low upper-frequency limit compared to the domestic dog and other carnivores. The Arctic fox can easily hear lemmings burrowing under 4-5 inches of snow. When it has located its prey, it pounces and punches through the snow to catch its victim. Arctic fox Facts for Kids. Kiddle Encyclopedia.